I like to live a very upbeat life, but the stress of seeing my sweet mom lost in the memory-robbed darkness of Alzheimer's disease can be overwhelming at times. Art is my therapy on so many levels, one of which is the fact that my love for creating started at a very young age via my mom. Anyway, what a fond memory of rushing to the sink with flaming paper and trying to erase all evidence of smoke and ashes (and colorful melted wax everywhere) before my father got home! Isn't oxidation beautiful? Yellow Ochre, Burnt Sienna, Burnt Umber, the blues and greens of patina... I wanted to create a piece that incorporated the colors of age; of rust in all it's beauty. I also wanted to convey a sense of wonder, by taking a peak through the rusted 'break' in the wall at the mysterious machine beneath. After applying black gesso to my canvas, I began adding texture. There is a veritable banquet of texture on this piece. (Yes, that's right, I just wrote 'banquet of texture' - remember my art studio doubles as my kitchen.) Along with Prima's Art Basics Modeling Paste, I used about five or six different stencils including TCW's Mini Gears, Penny Black's Oscillations and Tim Holtz's Measured. I applied Prima's Texture Paste White Crackle to the upper and lower sections of the canvas along with a heavy textured gesso concoction I mixed up to give the effect of corrosion. I love the look of dry wall tape, so that went down the center of the piece. While this texture overload was drying, I tore some card stock into pieces to make my 'rusted broken barrier'. This also received a heavy application of my homemade textured gesso goop. I decided barbed wire would be a good addition, so a grabbed a coil of craft wire and began snipping and twisting until I fashioned my own version of mini barbed wire. Next up: Color! This is my comfort zone palette and I used a mix of my favorites like Prima's Color Blooms in Cobalt, Tea Stain and Worn Leather; Ranger's Dylusions Black Marble & Melted Chocolate to mute tones in their vibrant Dirty Martini, London Blue, Postbox Red, Fresh Lime and Lemon Zest; Shimmerz Sprays in Tuscan Sun, Don't Be Suede and Don't Rain on my Parade; Tattered Angels Woven Burlap GM and Gold GM; Americana Acrylic Paint in Bittersweet Chocolate; and an ancient bottle of Creamcoat by Delta in Mocha Brown (I couldn't believe this old relic still had plenty of liquid-y life left in it!). Paint, spray, dab, repeat. Repeat again. I love, love, love making my own colors by mixing different paints; it is so fun pretending to be a 'Paint Mixologist'. I created a huge puddle of my rust-mix and then kept adding a touch of this and a touch of that to bring out some subtle tone changes. 'Rusting' the brass padlock, key, chains, Prima's Screw Heads and the barbed wire was the final touch. Another memory was brought to the surface when I sat back and looked at the tones. The shades at the top reminded me of a childhood adventure I was on with my parents in the mountains of Montana. My dad took us to this rustic, abandoned mining camp/ghost town. The area was richly colored in a coarse reddish sandstone with strands of green sandstone and shale by Neihart quartzite, and was one of only three places in the world where it could be found. The abundant mineral deposits including ore stained the earth and the water an array of colors. I showed my project to my mom today and told her I've discovered I have a passion for rust. She smiled and said, 'You've always been my funny girl.' Love you Mom! 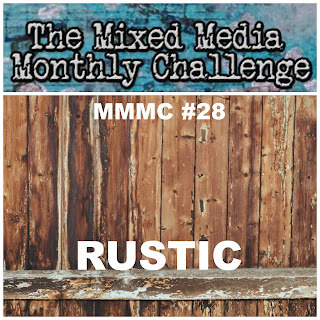 I would like to enter this piece into The Mixed Media Monthly Challenge for September; Rustic (and Rusted)! I would also like to enter the Canvas Corp Brands September Challenge. Their Tattered Angels spray in Woven Burlap and Gold were part of the 'cast of character in this canvas. 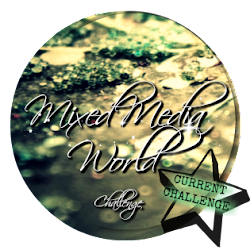 And, of course, the fabulous challenge MMW#19: Assemblage/Altered Art over at Mixed Media World!